We'll be building up a list of places of interest local to The Duke of Wellington that registered users can rate. This will help visitors to the area find the best places to go and might even provide some inspiration for us locals too. If you want more information on any of these, why not pop in and see us - we might have some further literature, advice or even discount tickets for some of them. Caudwell's mill Craft Centre is set in the most beautiful surroundings and the relaxing and informal atmosphere make it a unique place for an interesting day out. Whether you are just stopping to shop and have a coffee with friends or planning a family day trip, taking in the Mill and workshops, you will enjoy a friendly welcome and marvel at the stunning Derbyshire countryside. in the craft shop you will find jewellery, including the stunning Pilgrim range, pottery, preserves, books, frames and photograph albums. Cards, accessories and hand knitwear jostling for space amongst cutlery, tableware and soft furnishings. Toys and lots of goodies including a crystal and minerals treasure chest for children of all ages. Our garden decorations, bug and bird boxes are a great success and men will enjoy browsing through the walking books and maps and interesting gifts and gadgets. Located in the heart of the Peak District, Chatsworth has a range of things to see and do all round the year, for all of the family. Discover 105 acres of garden with giant water features, sculptures, beautiful flowers and magnificent views of the park. Explore the historic house, discover fascinating stories and enjoy one of Europe's most significant art collections. Browse the interiors, gardening, gift and pantry shops as well as Britain's best farm shop. Meet the animals, see how the farm is run and enjoy adventurous fun in the playground, including the new climbing forest. Gullivers Kingdom is a unique theme park designed to cater for families with children between the age of two and thirteen. The park contains a number of themed areas each containing rides, attractions, shows, restaurants and shops. 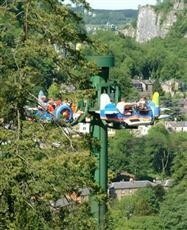 Gulliver’s Kingdom is set on a stunning hillside in Matlock Bath. The location is what makes the theme park unique, adding an extra dimension to your ride thrills, the illusion of super-high tower rides and flight-like coasters, and at an altitude of 629 feet (overlooking a valley some 300 feet below), there's not another log flume in Europe with views like it! Since first opening its gates to visitors in 1780 the Heights of Abraham has become one of the Peak District's most popular destinations. Originally the Heights of Abraham was only accessible to those few visitors who could scale the steep slopes of Masson Hill. 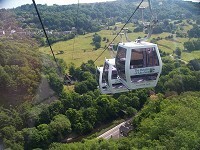 In 1984 Britain's first alpine style cable car transport system was installed. Rising from the valley floor, the observation cars transport you in comfort and safety and allow stunning views of the Derwent Valley and surrounding Peak District. Things to do and see include a children adventure playground Explorers Challenge, woodland walks and exhibitions or a tour around one of the historic caverns dated back to Roman times. Lea Gardens is a Rhododendron Garden just outside the village of Lea, close to Matlock. The Garden covers approximately three and a half acres, and is situated within a woodland area, with access paths which allow visitors to see the 500 or more varieties of rhododendrons, azaleas and other plants. The Garden is open to the public for viewing and plant sales, and there is also a very popular Teashop. Parking is free, and well-behaved dogs (on a lead) are welcome in the Garden. The Museum houses thousands of items, relics of the lost lead industry, which are explained and interpreted in an imaginative and thought-provoking exhibition. These include hundreds of rock and mineral specimens from around the world. Interactive exhibits and climbing tunnels provide something for the young and the young at heart. 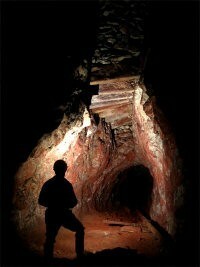 The top three exhibits include the Wills Founder Water Pressure Engine, the Howie Mineral Collection and the three mock-mine tunnels tunnels. 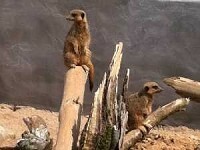 Matlock Farm Park is a family friendly open farm, providing a great day out with varied activities for all the family. The park has a large selection of animals to see including llamas, goats, peacocks, meerkats, chickens, pigs, alpacas, ducks and red deer to name a few. There are specially designed playgrounds and even a go-kart track for the kids and many places for the adults to relax if they wish. There is a lovely cafe serving hot food, a classroom and a gift shop. Established in 1906 on the undulating moorland above the town of Matlock, the eastern gateway to the Peak District National Park, the club offers a challenging 18-hole par 70 course of just over 5,800 yards (yellow tees) with spectacular views across the valley of the River Derwent and unrivalled practice facilities, including a fully-equipped, covered and floodlit driving range. With every hole different and the Bentley Brook meandering through the course to add further interest, the golf course is a regular choice for county and inter-county fixtures and each year welcomes many other visitors. Nestling on the edge of the Peak District in Derbyshire, just a few miles downstream of the Chatsworth House, our private beat of river Derwent near Darley Dale is available for all our clients to learn the art of river fly fishing. During your fly fishing lesson, you will be targeting wild brown trout and grayling using the dry fly, nymph and wet fly. The River is teaming with insect life and is renowned for it's fly fishing. Peak Rail is a preserved railway which operates steam and heritage diesel services for tourists and visitors to both the Peak District and the Derbyshire Dales. The preserved railway line is currently over 3 and a half miles in length and operates train services from Matlock station via the site of Matlock Riverside and Darley Dale to Rowsley South. A restaurant service called "The Palatine" operates throughout the season, whilst at Darley Dale there is a museum of the line's local history to discover. 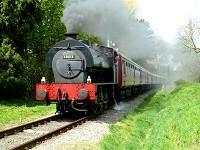 The railway also operates special events as well on top of the normal timetabled services. These special events include themed "Halloween" and "Santa Specials" for children and families; the "Warring Forties" event, with battle re-enactments of World War Two skirmishes involving military vehicles and re-enactors on the site; Diesel Galas; and local music festivals. Quiz Night (9pm)Win a bottle of wine at our fantastic general knowledge quiz featuring bingo and 'Play Your Cards Right'. Free snacks follow.